A committee was held in August to judge Project Vol. 3 Pass the Baton: 10,000 Creators Meet. In this project, we gathered product designs and ideas for ways in which to utilize the tube-shaped cut off ends of camel fabric, a material used in cold resistant underwear such as long underpants, etc. We asked: How can camel fabric underwear, known for having an “ugly” and “old” image, be transformed into an attractive product? How did the designers in this project change their perspective toward the product design in order to draw out and present new value? Please take a look. How much is “just right” when reworking recycled material? 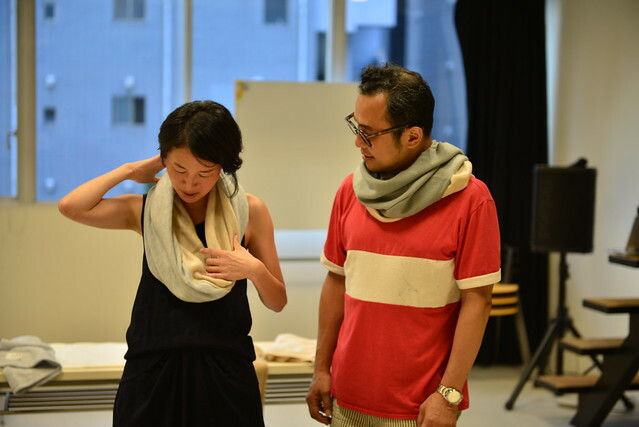 To begin with, Mr. Toyama of Smiles, Mr. Uehara and Ms. Watanabe of Kigi, and committee members of Ms. Hayashi’s Loftwork shared their thoughts with each other on taking the cut-off end samples in the directions of clothing and fashion that were the most popular collected suggestions. 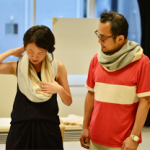 Ms. Hayashi: This camel fabric is the kind of material that women would like. It feels comfortable as something to wear while home. Mr. Toyama: “But let’s say we started making clothes with these in earnest. How much do you think we could get out of each piece? In that case, wouldn’t it make more sense to just use normal camel fabric? As in the theme of Project Vol. 2, the camel fabric used this time is also a material that can “be made into anything with money, time, and effort.” It appears that the key point in assessing ideas was the way in which the designers adjusted their perspective to take advantage of the strong points of the fabric, such as its nice feel, its ability to retain heat, and its ability to expand and contract, while keeping in mind how to transform the limited cut-off end pieces into an attractive product. After discussions, WOLFPROJECT’s “Recycled Rakuda (Camel) Fabric Room Relax Set” cushion case idea was selected as it utilized the tube shape and color of the camel fabric. This product is a comfortable cushion that has a blanket and “Monpe” (women’s ankle pants) made of the same material inside the case. However, as some committee members felt that creating a “Monpe” might be going too far, we plan to develop the product focusing on the blanket and cushion. Reaffirmed confidence in the cuteness of the design through prototyping. 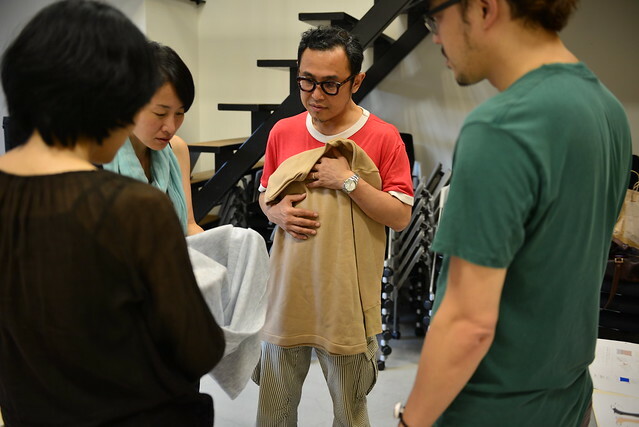 Along with entries we received from the public, we also considered whether or not to commercialize prototypes (sample products) that were created through the workshop held by the Taiwan Design Center in June. 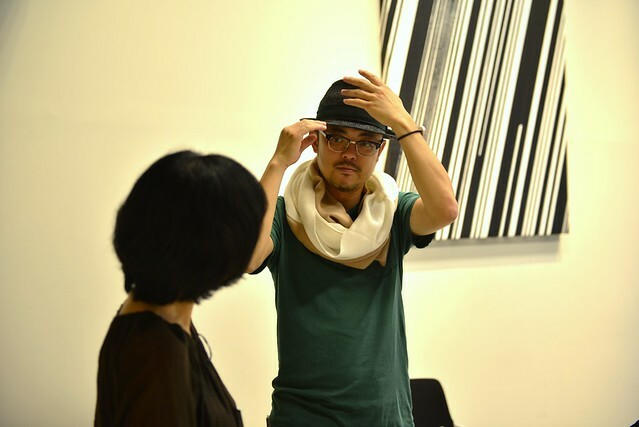 At the Make-a-thon, a workshop where designers get together to focus and create new products within a limited amount of time, designers from Taiwan and Japan formed teams together to create new products from the design formation to prototyping stage over two days under the same theme that was given to public entrants. From the five teams that were formed for this workshop, the suggested idea from the Camel Team was rated highly, resulting in the idea being specially chosen for commercialization. Workshop Host: Taiwan Design Center / Planning: Smiles Co., Ltd., Loftwork Co., Ltd.
Planning: Smiles Co., Ltd., Loftwork Co., Ltd.
Four people cooperated on the Camel Team, overcoming the barriers of language, to create a product that utilized each of their different skills. They worked together on all steps, from the background concept and story, to the packaging that represents a camel’s torso and the Africa inspired patterned tag. It’s hard to believe that four people who had just met could design such a product in just two days. The committee members all praised the product’s high degree of completion. 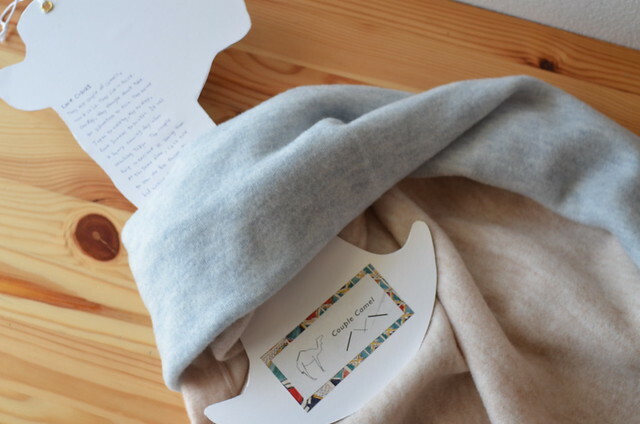 Ms. Hayashi: The Camel team progressed with product creation by making sure the product would truly turn out cute by connecting pieces of material together and trying the pieces on around the neck. This output is the kind that only comes from a workshop, but I really got a feel for how important the process of actually touching the material is. On the other hand, it appears that the wave-type seam of the product, which was chosen for its unique design, did not stand out very much when worn. This was one of some such opinions. In addition, using the wave-type cut reduced the amount of recyclable material, and so this aspect was chosen as something to be reconsidered during actual product development. When the theme for this project was decided, I worried if we would truly be able to arrive at our goal, but this worry was put to rest when I saw the designs that came in surpassing my imagination. The “Couple Camel” product that came out of the workshop took particularly good advantage of the concept and the power of graphics. The product was worthy of being the output of Pass the Baton: 10,000 creators meet. The more I experienced being a committee member, the stronger my feeling became that, as we are in business to sell products, if we are going to do this, we must make these concepts into viable products. However, it is important not just to think about what is “interesting”, but also to imagine what customers would happily purchase, as well as even the production process. In this regard, the chosen idea was truly easy to work with, and I believe we have arrived at a product that our customers will happily purchase. I was also worried whether or not we could really accomplish the task when I first saw what the project entailed. To be honest, I’m not sure I could accomplish it if I were to try creating it on my own. But, when I think about it more, I realize that it might have been more possible than I first thought when I was simply given a feel of the material and told to make something with a camel theme. I think it’s wonderful that we were able to arrive at a great product without becoming stuck on the image of camel fabric underpants. If we were to use the camel fabric cut-off ends as “cloth”, we would be able to make anything, but I felt that using the fabric in this way did not match the main intention of this task. The fact that the material could be made into anything only made the task that much more difficult. The chosen concept utilized the tube shape of the cut-off ends, but simply using the tube shape would have been too simple. By matching it with graphics, I feel that we were able to get across the charm of the product. There were certain areas that might need improvement during actual commercialization stages, but I believe that the product is complete. To be creative using this recycled product, I felt it was important to confront the issue by utilizing the optimum amount of what remained of the original raw material. Leaving the material too much as-is reduces its attractiveness, but being overly picky or changing too much can put a burden on production costs and product presentation. If you choose to apply only one creative idea, then the issue becomes how and what to change. It’s like thought training. I feel that Couple Camel solved the puzzle of this project extremely well.